When I first saw the New York Post article pictured above, my first thought was that it was likely an older article someone had reposted from around 2013, a time when sensational headlines about CrossFit killing people were all the rage. I was somewhat surprised to see that it was published yesterday. The New York Post took the article, repackaged it with a more click-bait appropriate headline, “Deadly condition linked to Crossfit on the rise,” and republished it on their website. The content for Wilson’s article is taken from another article, this one written by Rob Eley of the University of Queensland and published on the news website, The Conversation. Eley’s conjecture may in fact be correct. There may be hundreds of thousands of people training now who were sitting on their couches eating Doritos a few years ago. We should expect an increased incidence of ER and any other type of training-related injury if that were the case. The problem is that Eley erroneously presents his conjecture as fact without exploring equally rational explanations for the increase in ER incidence. As Eley himself points out, “There is no consensus as to what level of creatinine qualifies as a diagnosis. But it ranges from five times to more than 400 times the upper normal limit.” This alone should raise suspicion that the increased public awareness of ER has contributed to an increase in diagnoses. More importantly, Eley goes on to claim that CrossFit “has a particularly strong association with exertional rhabdo.” Wilson repeated this claim, and it is likely the reason for her directly linking CrossFit to the apparent increase in ER incidence in the previous quote from her article. The problem is this claim is completely false. All available information on the subject of CrossFit and injury contradicts Eley’s claim. Consider that a recently published review of the available literature on CrossFit’s injury rates concludes that “CrossFit is comparable to other exercise programs with similar injury rates and health outcomes.” One would expect Eley’s sensational claim, if it were true, to manifest in the data of at least one of the 13 studies analyzed by this report. Finally, and perhaps most egregiously of all, Eley claims (and Wilson parrots), that this “particularly strong association” between CrossFit and ER is “was accepted by the program’s founder.” His evidence for this is the 2005 CrossFit Journal article, “CrossFit Induced Rhabdo,” by Greg Glassman. Even a cursory review of this article shows that it was produced after a handful of isolated cases of CrossFit-induced ER came to our attention. Our intention was, and always has been, to raise awareness about ER despite its rarity both in CrossFit and the fitness industry at large. Yet Eley equates CrossFit’s publication of educational materials designed to help our community identify and prevent ER as an admission of his imagined “strong association.” By this logic, any trainers looking to educate athletes about the potential risk of rhabdomyolysis are admitting their program is strongly associated with the condition. So what are we to make of this? False claims from one relatively unknown author can be quickly spread by lazy news outlets more concerned with raising advertisement revenue than with fact-checking their stories. Yes, on the one hand, this article is click-bait, and responding to this type of yellow journalism often gives it the attention its publishers are so desperately looking for. On the other hand, the spread of false claims about the CrossFit program from a source as widely read as the New York Post will undoubtably harm the reputation of small business owners (affiliates) in our community if these claims go uncorrected. I agree that this article is “click bait”. As a physician with over 40 years of clinical practice in multiple settings I have taken care of many people with Rhabdomyolysis. Most of them were due to trauma or elderly people who fell and couldn’t get us for a period of hours or days. These cases are referred to as traumatic rhabdomyolysis. I only recall seeing one case of exercise induced rhabdo over the years and it was in someone who abused alcohol and steroids while trying to do an aggressive weight program. Most mild cases of rhabdo never are reported because the symptoms are mild and they recover without any specific treatment. Thus the true incidence of exercise associated rhabdo is very hard to pin down. The literature is fairly clear that those who are doing intense training in a supervised setting like CrossFit rarely get rahabdo. It most often occurs in untrained individuals with are doing intense exercise not in a supervised setting. I am currently out of work because of a back injury and I have really become deconditioned. About a month ago I joined an organization called Spectrum Fitness where you work one on one with a trainer. At their site I have seen many extremely buff young men doing what I consider to be extreme feats of lifting, yet they have never had a known case of rhabdo because these individuals have gradually worked their way up to a high level of fitness. I also read Glassman’s original article and to me it was full of sound advice concerning recognizing and preventing the condition. 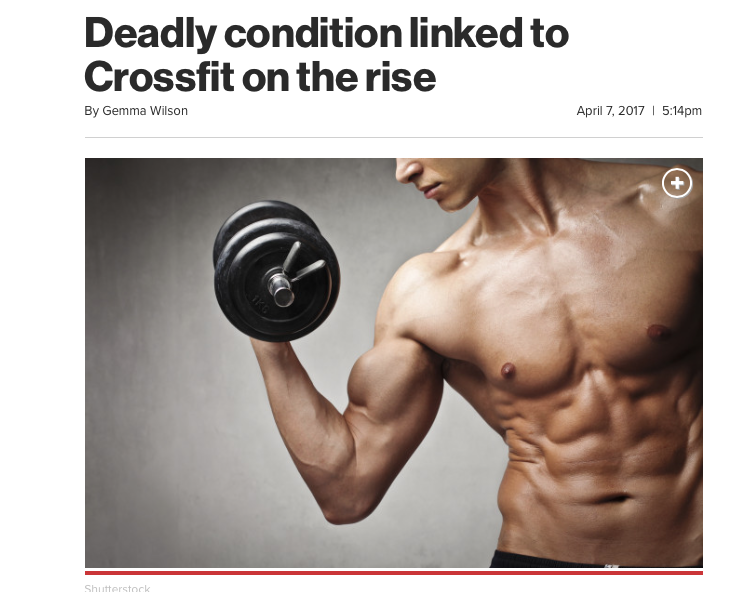 The title “Deadly Condition Linked to Crossfit on the rise” is extremely misleading. There is simply no evidence that exercise induced rabdo is on the rise and it still is a very rare condition. This article seems to be unfairly targeting CrossFit for unclear motives and reasons. If you want to avoid exercise induced rabdo, it’s easy enough to do: stay well hydrated, avoid using diuretics, statins or steroids, and work with a professional trainer if you are planning an utra-intense exercise program. Salacious headlines without substance are what news in the internet age appears to have become. While I am frustrated to see this lazy analysis/article move forward, I see the same lack of due-diligence in almost every other piece of news I read. “More importantly, Eley goes on to claim that CrossFit “has a particularly strong association with exertional rhabdo.” Wilson repeated this claim, and it is likely the reason for her directly linking CrossFit to the apparent increase in ER incidence in the previous quote from her article. How is that different than what you write, but yet Eley is “completely false”? Also, just because CrossFit has similar rates of rhabdo as other sports does not negate whether there is an association (strong or otherwise). It’s akin to the cigarette industry taking issue with an argument linking smoking with lung cancer by saying, ‘yeah, but asbestos and other things cause cancer too.’ Yes, there’s an association between rhabdo and a host of other activities. He states that in his article. So what? Are you trying to argue that there’s no or minimal risk of rhabdo for people doing crossfit? Eley’s claim is that CrossFit “has a particularly strong association with exertional rhabdo.” Those superlatives appear to mean something, yet the data cited shows that CrossFit has similar or lower rates of injury (which includes ER) than other fitness activities and sports. I cited the same data to show that the “particularly strong association” Eley describes isn’t supported by the source he linked to. If one fitness program has a documented ER risk equal to or less than the majority of fitness programs, referring to that association as “particularly strong” is misleading and inaccurate.